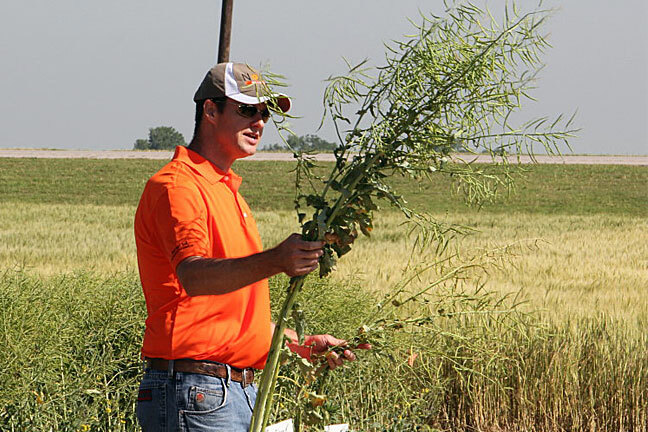 With canola planting time fast approaching, Dr. Chad Godsey, cropping systems specialist with Oklahoma State University, said it’s time for producers to narrow down their variety selections. He spoke at the recent Winter Canola Conference in Altus. Godsey said we learned a great deal from last year’s variety trials. He said OSU conducted six replicated variety trials in the western part of the state, and interest from new seed companies is growing. He said canola varieties have advanced rapidly in less than a decade. “Six or eight years ago, we still had winter hardiness issues. With all the commercially-available varieties and hybrids that we have, winter hardiness isn’t that big of an issue for Oklahoma. Now, it may be in Kansas, but for most parts in Oklahoma, winter hardiness is not an issue. Godsey said yield history is a big factor to consider when selecting a canola variety. “Looking at past yield history in a multi-year period and really just pick varieties or hybrids that fit your management strategy. If you’re an experienced canola grower that’s shooting for that 2500, 3000 pound yield goal, a hybrid may be a better option for you. Godsey also said producers would benefit from planting more than one variety. He said growing conditions vary so widely from year-to-year that it helps to have more than a single base covered. He said different varieties have different dates to maturity, so that producers planting multiple varieties can take advantage of staggered harvest times. Click on the play button in the video box below for the latest edition of Canola TV. Canola TV is a service of Producers Cooperative Oil Mill. Click here for their website where you can learn more about their efforts to serve farmers growing cotton as well as winter canola.